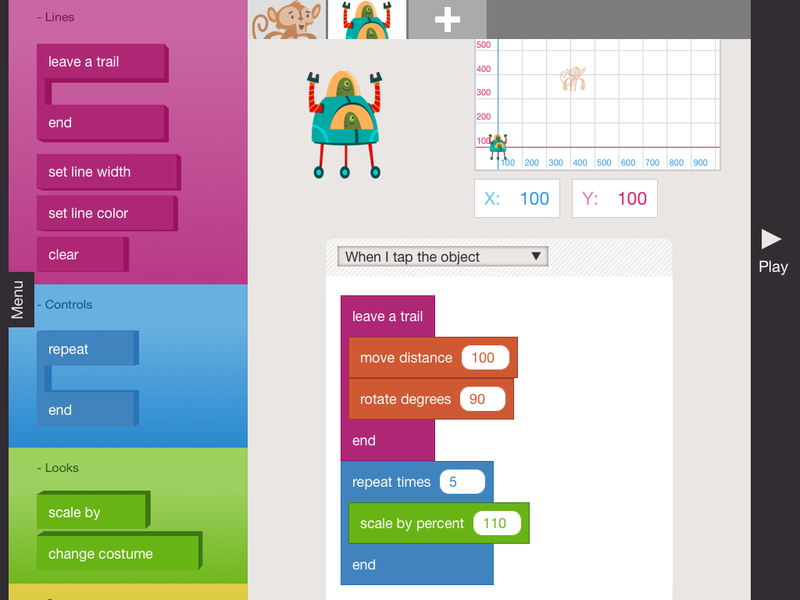 Hopscotch is a block-based mobile programming application that helps kids easily build games and animated artwork – a visual programming language similar and based to Scratch. Through the process, kids can become familiar with coding fundamentals. Blocks are the favored way to learn to program from Harvard and MIT to Code.org and Google. Using blocks to learn coding logic and concepts before diving into the syntax of coding languages. With Hopscotch, kids master core coding concepts, like loops, variables, and conditionals, that transfer to any language. They practice problem solving and computational thinking while bringing their ideas to life. Hopscotch’s community allows them to safely collaborate with peers and express their creativity. The main screen of Hopscotch provides children with a library of commands that an onscreen character will perform. The characters move around the screen and leave trails behind them (or not, depending on what settings are active). Children can design motion patterns, line styles, method controls, character looks, and operators. By adjusting controls, children can design simple animations, have characters draw lines that become pictures, and even create basic games. The base app is free, but there is an option to change to premium subscription – plans available from $6.67/month.